College Baseball Scholarship: You should always have a plan B. A College baseball scholarship is a legitimate goal for ballplayers and their parents. If one is good at something it is very normal to pursue a sport that you can get a supplement for a college education or a very rare professional baseball contract. It is very worthwhile to follow your desires and do things you like to do. But make sure you are realistic and have a plan B. The numbers are against you. The statistics say very few players will play baseball past high school. After all you have already beat the odds. Statistics say 75% of players in youth sports are out of the game by the age of fourteen. Let us look a little closer at the numbers. The National Collegiate Athletic Association displays data they have calculated this year. The NCAA has estimated the probability of competing in athletics beyond the High School level. About 6.3 percent or 3 out of 50 high school players will go to play baseball at an NCAA member institution. Approximately 9 percent of NCAA college baseball players will get drafted by a Major League Baseball Team. About one in 200, or about 0.44 percent of high school players will eventually be drafted by a MLB team. For sure if players have dreams then by all means one should pursue them. It is important to be realistic and have a backup plan. Sports can be very competitive at the higher levels. Even if one were to overcome the percentages and data to reach the higher levels of baseball keep in mind injuries can happen, too. I was fourtunate to spend 19 years in professional baseball. My job most of the time was to develop players for the major league team the Boston Red Sox. I worked in a minor league system that was able to have players ready to replenish the 'Big Club'. That is exactly how I look at our youth baseball player development system except the 'Big Club' is not a Major League Baseball Team. Let me show you more detail on the local Youth baseball organizations and how this can be the feeder system to provide baseball players for the local high school teams. Only about 10% of youth baseball players will ever play high school varsity baseball. Therefore for me, the high school baseball team is the goal for local youth baseball players and baseball parents. If a player reaches the varsity baseball team then that is quite a baseball accomplishment. Players and parents should be very content when kids experience baseball at the high school level. This is why locally is so important to have a player development model in action. 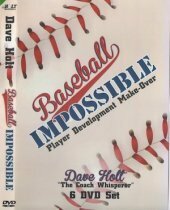 Are we super focused on developing baseball skills which put as many players as possible in position to play in high school? If not here is more detail on how to make this happen. Occasionally a small number of players will go on to a college baseball scholarship and even fewer to the professional minor leagues. Some will even get a portion of their education paid for. Let me show you a way to finance your college with or without a baseball scholarship.